The story of Velorossa Design and Nate and Mandie Fleming's adventure begins during the recession of 2008. Times were tough for the Flemings, who depended on Nate's career as a construction electrician. To make ends meet, Nate began fixing and selling cars in his times of unemployment, but lacking a trailer made it difficult. Mandie decided to go to the local community college and enroll in the welding program. She built them a car trailer able to haul the broken cars. While Nate continued fixing cars, parts began to pile up. Mandie felt inspired to build them into sculptures, putting her welding skills to work again. As construction work picked up, Nate found himself traveling for work. Having to work away from his family was difficult, and the decision was made stay home and depend on both Mandie and Nate's resourcefulness. In 2011 Velorossa Design was born. Velorossa's mission is one of being an eco-friendly lighting manufacturer. Inspiration is drawn from the very objects thrown away, from clutch plates to pistons. Small bits of scrap of all kinds are reused into collages, the result being almost zero waste produced. Our lights are unique. We use what we find. We also strive to incorporate functionality into our designs, seamlessly blending our style into useful function. The handmade and recycled qualities mean no two lights are identical, each maintaining the spirit of its maker. We sell our products through a select line of retailers who we feel share our commitments. We believe in inspiring not only through our designs, but through excellent customer service and quality. 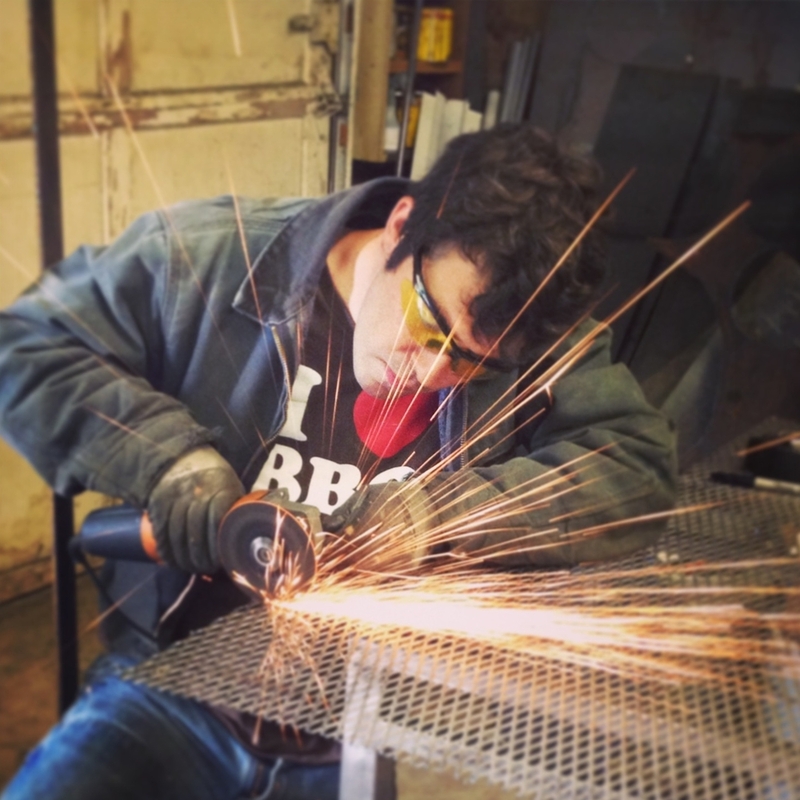 In a manufacturing world concerned with bottom dollars, we seek to set ourselves apart. We excitedly offer a line of lighting that is as unique as the hands that have crafted it. We hope you find it inspiring too! Mandie Fleming carries the aesthetic eye for design, art and nature. . As the inventory of parts is ever-changing, so is Mandie's perspective. She is constantly pushing boundaries, bringing life and elegance to the neglected. Nate Fleming is a licensed electrician that has specialized in everything lighting. He contributes the technical expertise to bring function and efficiency to each concept. Currently involved on a new take of high-efficiency LED technology to incorporate into their designs, Nate is in a perpetual state of innovation. The Fleming's design process is unique in that all are designed by both. From visualization and initial sketches to finishes touches on fabrication, they are communicating and designing together the entire time. With this unique collaboration they are able to balance art and function in new ways. We are currently looking to expand. If you are interested in carrying our line please contact us at velorossa@gmail.com.